Don't they look awesome?? 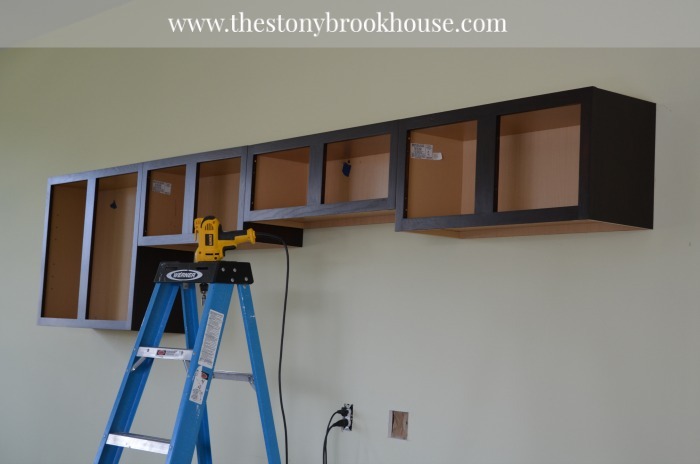 First, we attached the upper cabinets. When you are installing cabinets always remember to do the uppers first. If you do the bases first, it will be awkward trying to install the uppers leaning over the bases. Make sense? Hubby put up a bracket along the length of the uppers. 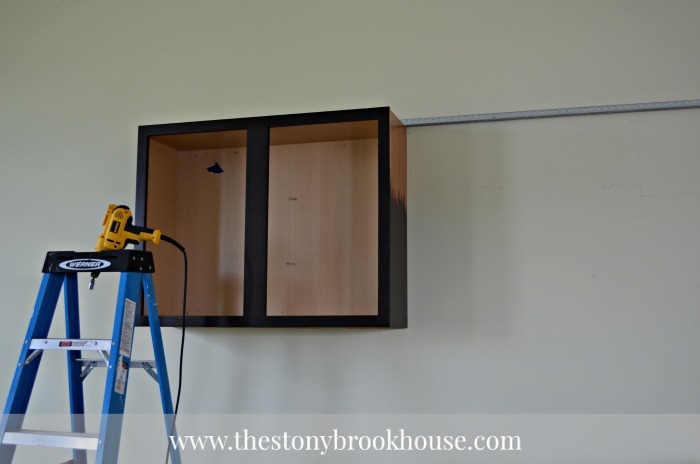 It made it so much easier holding up the cabinet against the bracket while attaching it to the studs. 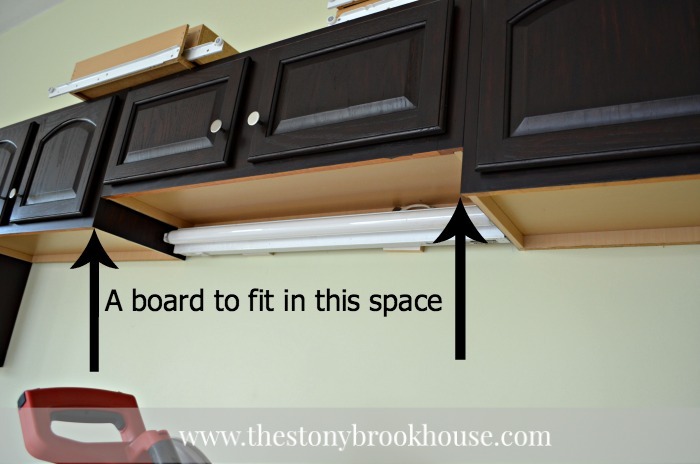 Plus all of the cabinets will automatically be level. 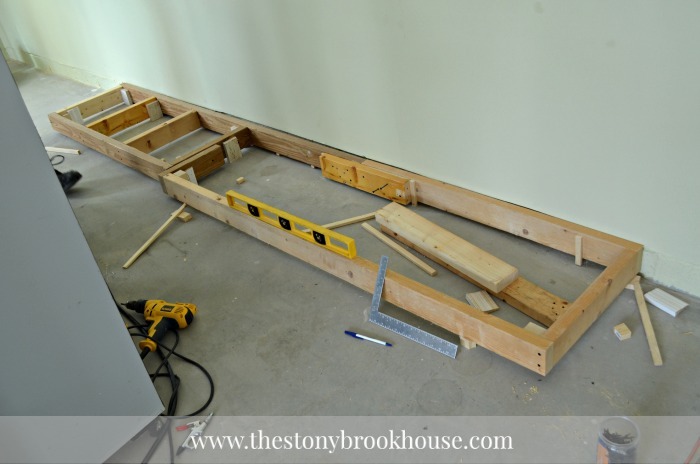 Hubby also predrilled all the holes and lined them up with the studs, which made attaching them quick and easy! Before you knew it we had all the uppers installed! 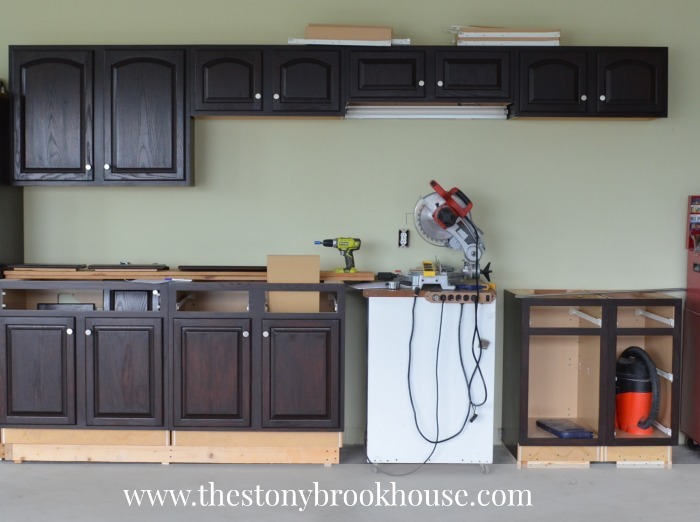 Did you notice that the base cabinets on the left are taller than the ones on the right? It's not that much, but more than you might think. Well, the reason... Hubby is about 6'4" and the cabinets on the left suit him better. The cabinets on the right, serve a dual purpose. One, the height is more suitable for me and see that saw, well, if he has a long board he can rest the board on the right cabinet and it will be level. It works. And that white "cabinet"... I bet you'd never guess what that is.... It's an old portable dishwasher casing. Yup! It's on wheels, so it's actually pretty handy. Hubs plans on putting in some supports and also "installing" our large shop vac into it, so that will be portable as well. 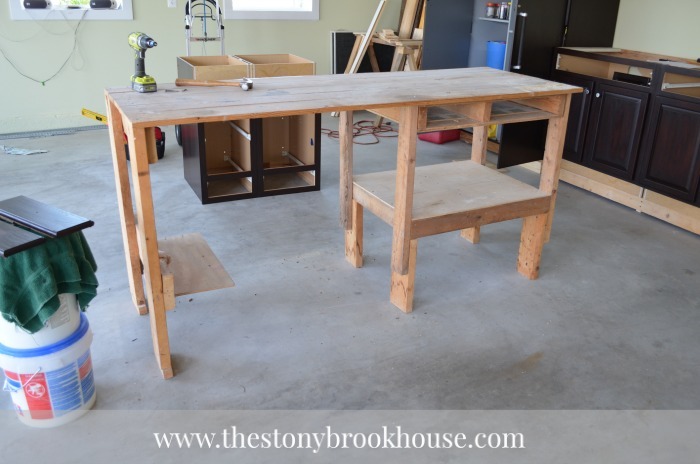 And without the saw on it, it will roll right into place and fit under the counter top that will be there. At least that's the plan. I also worked on a storage cabinet we had in the garage before. Hubs wanted it to "go with" the cabinets better. It was originally light gray like the right side. I primed it and then spray painted it. 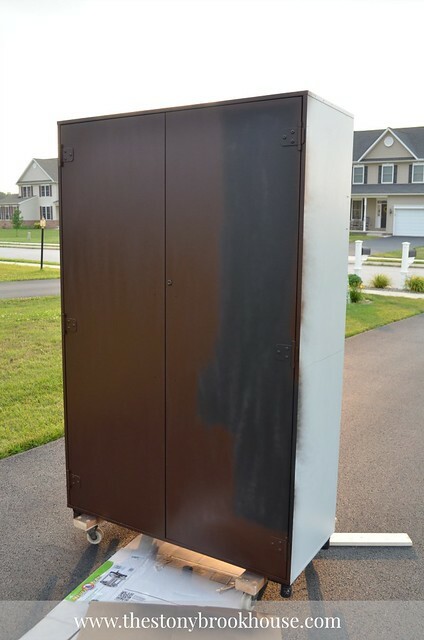 Well, spray paint doesn't always work well on large flat surfaces.... We were just going for a dark coffee brown. Ehhh... it came out so so. Not really thrilled... So, I thought about adding stain to it, maybe that would make it blend in a bit more. I think it looks better than it did! 2. 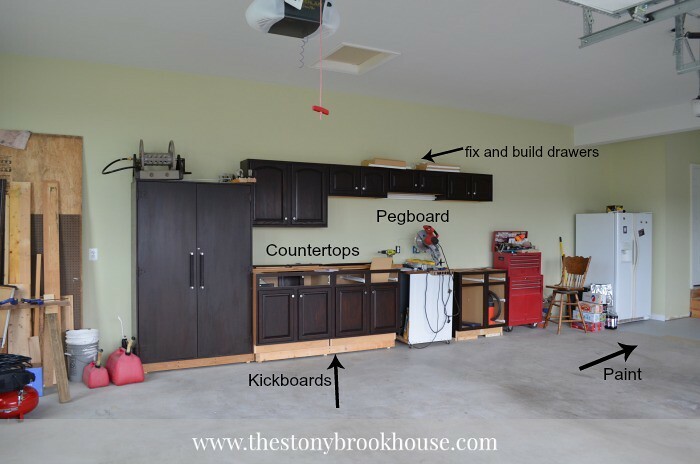 Install the wood counters. 4. 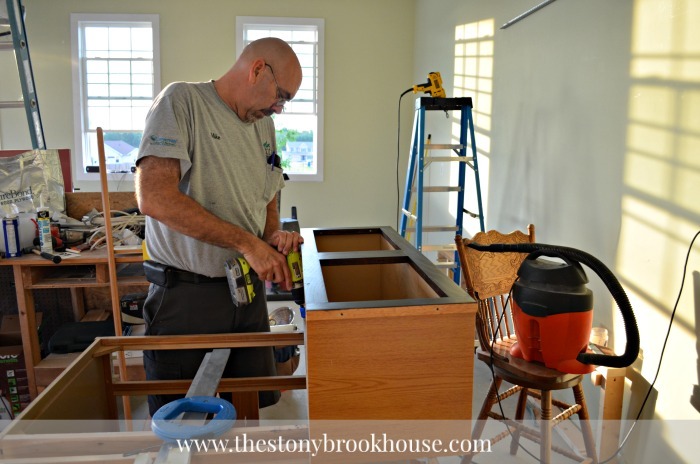 Fix and install drawers. 6. Fix painted area where we tried to stain the concrete floors... See that FAIL HERE!